Literature lovers and Poe enthusiasts will enjoy a visit to Poe Baltimore, the Edgar Allan Poe house and museum. 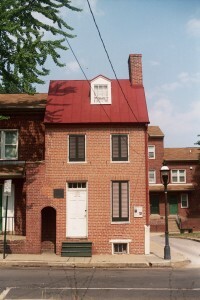 Poe’s home has been preserved with much of the exterior and interior original fabric (although the house isn’t furnished). A weekend self-guided tour of the Edgar Allan Poe house and museum allows you to get a feel for the town and the very walls that set the landscape for Poe’s imagination and work. You’ll see exhibits on Poe’s foster parents, his life and death in Baltimore, and poems and short stories written in Baltimore. It also features significant artifacts including Poe’s chair, lap desk and telescope. Any of the docents can answer questions and give insight into Poe’s life. Although it doesn’t take place at the Edgar Allan Poe house and museum, there’s no better way for Gothic literature enthusiasts to spend Halloween than at Poe’s Black Cat Ball at the Mobtown Ballroom (861 Washington Blvd) from 8pm till midnight. Attendees will get an exclusive first when the next Poe Toaster finalists are announced! But what…or rather who…is the Poe Toaster? A mysterious tradition began sometime in the early 20th century, where a shadowy individual would appear at Poe’s grave, toast him with cognac, and leave three red roses in a specific pattern. Through the years, the original toaster’s legacy was passed on to “a son,” and notes were occasionally left. Around 2010, the Toaster stopped coming. Now, in partnership with the Maryland Historical Society, each year the Edgar Allan Poe house and museum auditions and selects a Poe Toaster to carry on the tradition. Learn more about the Poe Toaster at the Maryland Historical Society website. Westminster Hall and Edgar Allan Poe’s grave are in the southeast corner of Fayette and Greene Streets. From the Poe House on Amity Street: Continue south on Amity to the end of the block. Turn left on Lexington to the first traffic light, which is Fremont. Turn right on Fremont and follow for 2 blocks south to Baltimore Street. Turn left on Baltimore and go 3 blocks to Paca. (The University of Maryland Hospital will be on your left and the Veterans Hospital on your right.) Turn left on Paca and stay in the left lane. Go one block and turn left on Fayette, heading west. The next street is Greene. Westminster Hall and the Poe Grave are immediately on the left, at the corner. Although mystery and intrigue surrounds everything about Poe, from his death to his burial and beyond, one thing is for sure: a Poe pilgrimage should begin at the Edgar Allan Poe house and museum. We’d love to host Poe enthusiasts at the historic Wayside Inn in nearby Ellicott City. Book your stay and download our free vacation guide today! 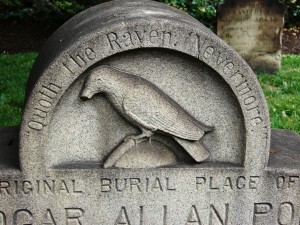 Did You Know You Can Visit Edgar Allan Poe’s Grave?